In his book, “Writing Broadcast News,” longtime writing coach Merv Block lists a plethora of “Venial Sins.” One of them is don’t start stories with prefabricated phrases. Fortunately for the press bosses of candidates, newsies don’t pay much attention to Merv Block anymore, and as a result — starting today — there’ll be a rash of prefabricated stories based on the beginning of filing season for candidates whose candidacies we already recognized. What’s the story? Their candidacy is now official. 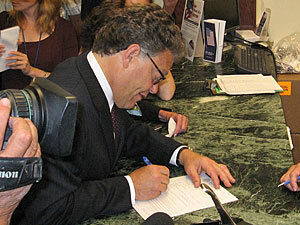 Al Franken kicked the prefab news season off today by filing papers in his run for U.S. Senate. The Minnesota Secretary of State opened the filing season last week. It’s a matter of filing routine paperwork and that’s all it is, aside from an opportunity to get a little prefab publicity. How many times can you make a news story out of making your candidacy official? At least three, and by the end of the day, four, which is merely a fraction of the stories one of his competitors has been able to fabricate by not saying for sure — one way or another. Sen. Norm Coleman, by the way, has not yet made it officially offical. I wonder if he’ll run? I’d have to say I go with Merv on this one. Prefabricated phrases used to open are weak and so contrived.